I jump on the sofa and pull my (now electric) blanket around me….find a station that I like (I had to see the finale Thursday night of How to Get Away with Murder) and feel the most blessed sense of gratitude for having a happy room with a warm crackling fire and time for myself to unwind and reflect… watch television, read, or simply think back through the day with a big thank you to God. I really cherish this time each evening…not allowing myself to start it until the blog is finished and tucked away, the kitchen cleaned, and the house semi-picked up. It is my closure to another day of life…a celebration of sorts for still being in it. Ever since I heard God’s voice calling out to me in the den almost seven years ago… asking me to “Hold His Hand“…I continue to feel a special aura of delight and happiness around His Presence felt in that room…thus my name for it…“The Happy Room.” Reflecting back on its creation…I now realize that it only came to fruition, after some personal, deep, dark soul searching. In 2007 the renovations began (after much discussion with close friends over to “Love it or Leave it.) I realized I loved my home and I wanted to stay…I just didn’t like the dark colors and drab furniture…left over from the earlier “me” days. …And it does have to start in the basement or the dark, scary, bottom of the house. For me my dark soul-searching days correlated with my cancer diagnosis and facing an uncertain future…but also coming to grips with who I was at the moment and who I wanted to be for the remainder of my life. Hint: Do you know the easiest way to discover your own identity, as seen through others…stop and look at your friends. Who are the people you surround yourself with….who you have been drawn to in friendship by some unknown magnetic draw. In the book (above) the author Vanzant uses the metaphor of cleaning out a house from the basement to the top floor as the spiritual approach we must take to facing our soul…our true self…and then nurturing it through all the stages of life until we are happy to just be ourselves. It is then that love appears. Getting to know ourselves, our souls, takes a lifetime doesn’t it…but, yet, we all know when we are happily content in our lives…our own personal homes and space reflect the change in us. And folks…I am pretty darn happy! 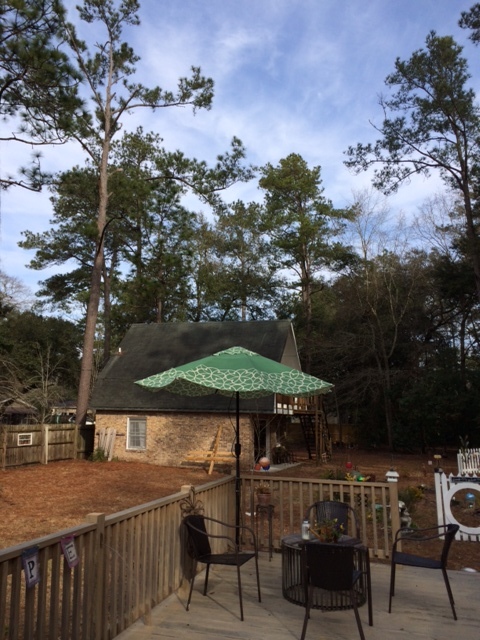 And guess where I am taking my happy soul now…OUTSIDE or as Rutledge would say “OUTSHIDE”….because the SUN is OUT and the garden is calling me! The sun did come out tomorrow (today) and I couldn’t be happier! 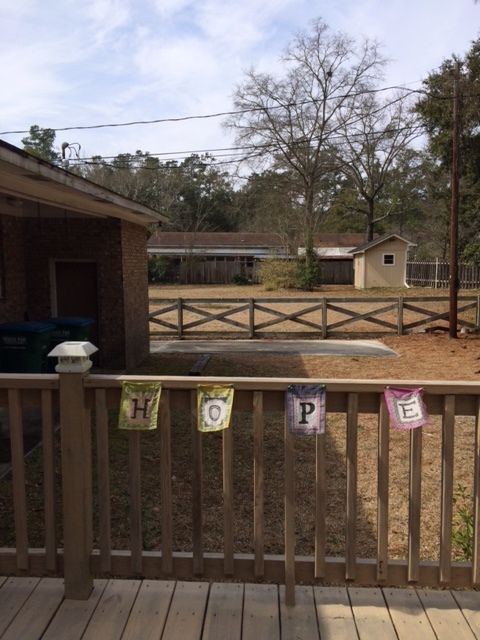 Blue skies and HOPE letters smiling in the sunshine on the deck! So until tomorrow…Stop the soul searching for a moment and think of your special friends who are there for you through thick and thin and then SMILE….see yourself in their reflection! Now go find or create your Happy Space! 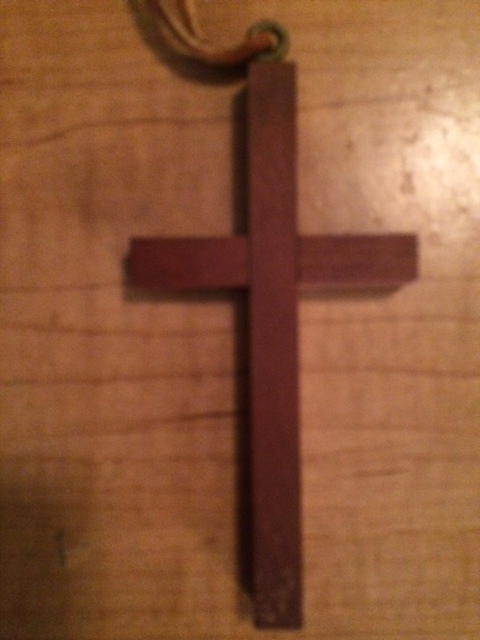 ** I am sorry to let you know that two of my special friends lost their mothers this past week. Both Gin-g Edwards and Susan Gaston are dealing with funeral arrangements and telling their moms’ good-bye for now. No matter how old we are or our parents are when we lose them….the child/mother bond is so strong…it is never easy to let go. Please keep Gin-g and Susan in your prayers. I would like to share an eulogy in prose by Sir Walter Raleigh that I love… for both my friends. I hope you like it. Listen …and keep very still. Becky, We ARE birds of a feather – I totally connected with what you are saying today. 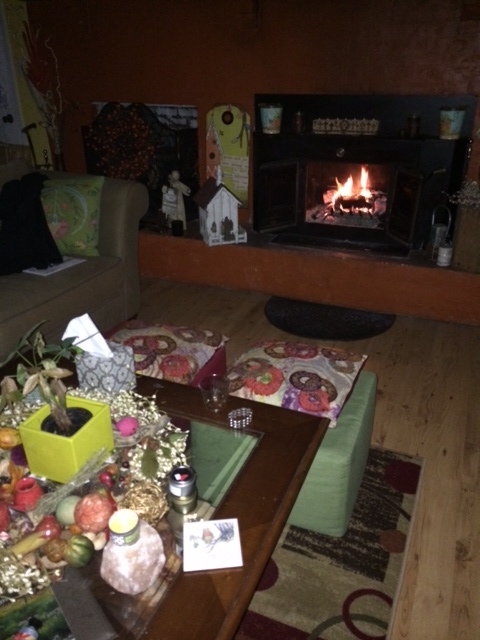 It really struck a chord about friends and building that Happy Room – in my case a Happy Home. It’s unbelievable that it has been almost three years since I paid two guys $50 to rip out that stained, flea-infested living room carpet as the starting point for my new journey! Then, with the help of friends and family, came new chair covers, new doors, fresh paint, car loads to recycling and Goodwill, a red (!) sink, etc. This week I had insulation installed and electricity run to the unfinished upstairs room – hmmm, perhaps my yoga room? Thanks for being such a wonderful friend – through thick and thin! PS I HEARD my mom’s laugh as I read your words…what a gift! Anne….I will always remember the red sink….for me, watching you, it symbolized the new beginning…the metamorphosis between the old and the new you….the best was yet to come.Think about all the adventures that were about to begin! Becky, connected so with your entry today and especially loved the eulogy – my mom passed a year ago and I hear her every now and then. I have been re-reading Simple Abundance this year and oddly enough, February 28 is titled “Creating a Sacred Space.” I am thinking that it will be in the room over the garage. I too am looking for a yoga spot, Anne. Cindy….what a God’s wink! I just looked up Feb 28 and saw the entry “Creating a Sacred Space” and somehow I ended up at the same “sacred place” on the same day using a different road. God has such a wonderful sense of humor….just goes to prove that we will all end up in the right place at the right time…no matter which detour we take. Love the yoga spot idea! What a wonderful story!!! I believe we can all relate. 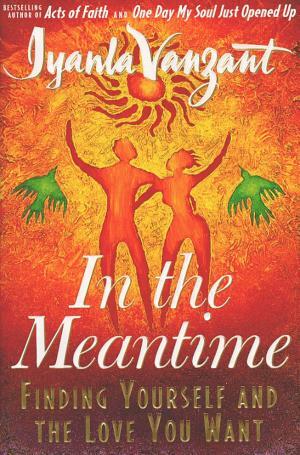 I ordered the book, “In the Meantime”. You brighten my life. Thank you. Carolyn, I am so glad you liked it…I have missed seeing you at church….between Ya retreats and babysitting I have been busy…but thank you so much for your sweet comments…with this dismal weather we seem stuck in…I am glad to be able to brighten something…and especially a something as special as you!